President Dmitry Medvedev has officially accepted the offer to become the leader of United Russia and said he is also going to join the party. “Thank you for the proposal. I officially accept it,” he said at a meeting with the core group of United Russia. Medvedev also said that he is due to join the majority party, adding that in the future any party leader should be a member. “And the President in the future must necessarily be a party member. Otherwise we simply wouldn’t be able to explain to people which political force is in power,” he pointed out. 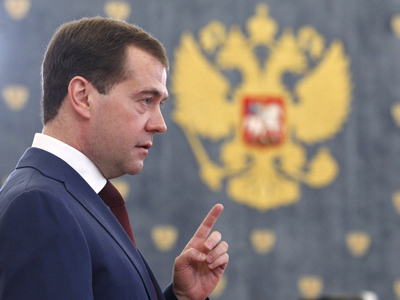 Medvedev said the offer to lead United Russia is “a very serious responsibility” for him. The point is not only the fate of the party, he said, adding that for quite a while he was relying on United Russia for the political course he was pursuing. “It’s also the issue of the development of the country: where it would go, what it would be like, and what will be happening with us,” Medvedev stressed. 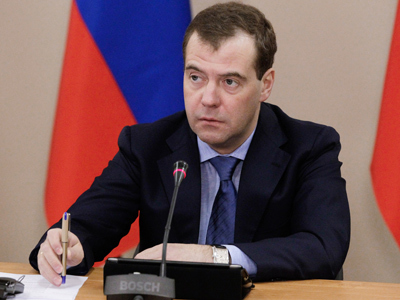 Medvedev is also confident of a great future for United Russia and all the talk about its decline is “nonsense”. “What we offer and state is a response to the needs of an absolute majority of the people,” the President pointed out. “Other people will replace us, new leaders of the party and leaders of the state would come, but values will remain the same as the tasks that this kind of party is solving will also remain in any society. That’s why the party will also remain and be the leading political force in our country. 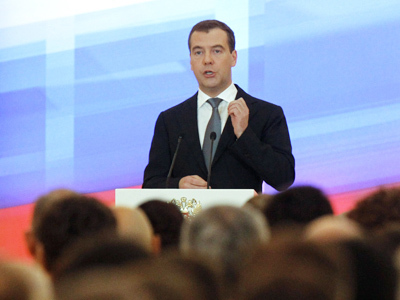 I have no doubts about that,” Medvedev said. Changes in the party’s structure, leadership and charter were on the agenda of Friday’s gathering. Earlier this week, the current leader of the majority party, Prime Minister Vladimir Putin said that he would resign from the post of United Russia Chairman after his inauguration as President on May 7 and proposed Dmitry Medvedev to replace him. “If for some reason [the leader] does not join it, at some point he will start to separate from the party. This is possible in some posts, such as the presidential one. However, in principle, it is not right. 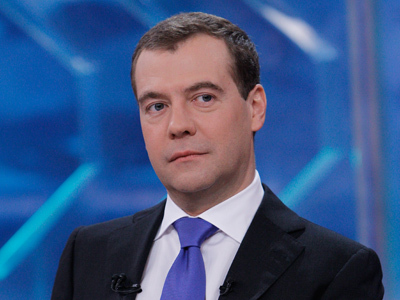 Therefore I believe that a party chairman should be its member,” Medvedev said. The official election of the new party chairman is planned for May 26, when United Russia is holding its congress. United Russia introduced the post of party leader in 2008. Putin was the first and so far, the only person to hold this position. Previously the top post in the party was the Chairman of the Supreme Council, occupied by Boris Gryzlov, and after 2008 Gryzlov remained the head of United Russia’s parliamentary faction. 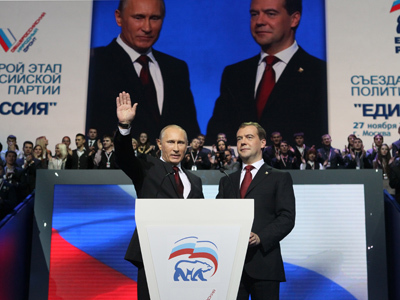 The party informally announced Putin as its leader even earlier – when they used his image and a program called Putin’s Plan during the parliamentary elections in 2007. Back then, Putin’s popularity and support allowed United Russia to get over 64 percent of the vote. However, last December’s parliamentary poll revealed a sharp decline in the party’s popularity and brought its support to slightly over 49 per cent. Still the majority party in the State Duma, it has lost the ability to make changes to the constitution without approval from other Duma parties. The 2011 vote was followed by a series of mass protests against alleged election violations and so-called extensive use of administrative resource – pressure from state officials to vote for United Russia. According to a survey by the Russian Public Opinion Research Center (VCIOM) published earlier this week, 41 per cent of Russians support the ruling party.